My ArthroZyme Plus Review – Is It Any Good? Now – it claims to have a better formula, which I personally doubt (judging after the ingredients). However, you can’t really tell until you try it. So does ArthroZyme Plus relieve joint pain – or it’s too weak? I tried to dig deep into this supplement to find out the truth behind it. Note: This review is based on my opinion about ArthroZyme, not on general info. I’m not trying to praise/ criticize the product or its company, I am simply telling my opinion about it. Where You Can It Buy From: Amazon. You can find a lower price on Ebay, but it’s a bit more risky. The price on the official website is $3 more than on Amazon (which is pretty weird). Designed For: Joint and muscle pain – according to the label. It contains mostly anti-inflammatory substances, so it wouldn’t help osteoarthritis or cartilage problems too much. My Rating: 6 out of 10 – Surely not a scam, but not amazing either. It’s good enough for minor inflammation (tendinitis, sprains, injuries) – but there are many cheaper products that can do. The good part is that ArthroZyme is produced by a legit company – with several supplements in their resume. So there are small chances that this product is a scam. In my opinion, it’s simply a bit overrated – for what it contains, it shouldn’t cost above $30. But now that you know the general things about it, let’s get into more details about ArthroZyme. So according to actual studies – vitamin D has very little to do with joint problems (unless you have a major deficiency). 2. Zinc (15 mg) – this mineral is useful in RA or other inflammatory condition. But the thing is – it helps mostly when you have a zinc deficiency. If your level is normal, you won’t get any benefits from it. I couldn’t find many studies on bromelain and joint pain – but in my opinion, it’s a very useful substance for inflammation. So basically – this ingredient is the only new thing from ArthroZyme. You can find the other ingredients in many products, but the serratiopeptidase isn’t as common. So you can’t really tell what this supplement is based on – it contains more ingredients, but none seems to be more important. #2. Good Doses – I know that at first sight, ArthroZyme seems to have some low doses. So if you analyze these facts – ArthroZyme’s doses are pretty good actually (for these ingredients). I tried lots of supplements with different ingredients. But I wouldn’t really trust ArthroZyme’s formula – at least not for amazing results. It can work decently – but I doubt it’s going to make miracles. Overall: Not the best ingredients ever. The Boswellia extract can’t work amazingly on its own. And some of the other ingredients can’t do a lot either (Vitamin D, Zinc, Serratiopeptidase). So it is “a different formula” – but not in the good way. ArthroZyme is one of the supplements I reviewed without trying in reality. But as I tried many other products with similar ingredients – I think I can get an idea without trying it. It’s a good product for bone health (high dose of vitamin D). It can help minor swelling (bursitis, tendinitis, gum inflammation). For joint inflammation, it’s not very strong. I doubt it can relieve arthritis pain completely. It can also help for pain caused by a zinc deficiency. So overall – I wouldn’t recommend it for arthritis or chronic joint pain. It’s just not strong enough for a serious condition like this, in my opinion. Now – if you only have a temporary problem (an injury), ArthroZyme should help. However, I think it’s a bit too pricey to be the #1 option. It’s not a very expensive product – but you can get something better for less money. So I wouldn’t start with ArthroZyme for a minor problem. However, besides its bad points – it also has some good ones. So let me show you briefly its top and bottom lines. So even though its ingredients could be better – there’s nothing to complain about the pills. Now – I tried to find some pictures of the real pills, but it seems like the official website doesn’t offer any. In this case, I have to trust the reviews I read – which mentioned the pills aren’t very large or hard to swallow. So there’s nothing I could criticize about ArthroZyme’s capsules. Now – I couldn’t find any reviews on the official website, but they simply don’t have any review page. So that’s probably the reason. However, ArthroZyme is also sold on Amazon – so there are plenty of authentic reviews. Now, to be honest – many of the reviews I found were negative. But most people complained about the product not working amazingly – so it’s surely not a scam (as I read on certain websites). In my opinion – ArthroZyme could be a few dollars cheaper, considering what it contains. So that’s not very fair, if you ask me. For $32, you can almost buy 2 bottles for another supplement with better ingredients. Now – there are lots of products that cost well over $32. So ArthroZyme isn’t the most expensive one ever. But if you decide to buy it – there’s one thing you should keep in mind. To be honest, it’s pretty weird. Most companies sell their products for more money on Amazon – so that people would buy from their official website. I already mentioned the ingredients, so I won’t insist too much on this topic. So if they really wanted to charge this price for ArthroZyme – I think they could have added some extra substances (like the ones I mentioned). Obviously, this mix is going to be enough for some. But if your joint pain isn’t something temporary – you will probably need something stronger than Boswellia and Bromelain. My Verdict – Is ArthroZyme Plus Worth Buying? Short answer: I’m not sure. I would recommend it for minor joint swelling or bone health – but I think you can find some cheaper stuff. Now – in these cases, it should really help. As I said – I didn’t try this supplement myself, so I can’t speak from experience. But judging after how it looks and the reviews I read – I wouldn’t really recommend it. At least not as a #1 choice. You can get something much better for less than $32 – so that’s what I would choose for arthritis or chronic joint pain. Thanks for this review, my mom used Arthrozyme Plus for her hand arthritis with no use unfortunately. I saw this advertised on the internet and thought she might give it a try. But she should probably stick to her prescribed treatment and additionally glucosamine and chondroitin, I heard they make wonders, you say this too. She might give another supplement a try, but it will surely be different from Artrhrozyme Plus. Thanks for pointing out some things we had no idea about (the ingredient’s power). Hello Johnny, I’m sorry to hear you mom didn’t get any better from Arthrozyme. You didn’t mention what kind of arthritis she has, but it’s probably osteoarthritis. In this case, yeah – glucosamine and chondroitin are my top recommendation. Arthrozyme contains mostly anti-inflammatory substances, so that’s why it didn’t really help. If your mom has OA, she doesn’t have a lot of inflammation, she has mostly cartilage damage. That’s why she doesn’t need anti-inflammatory too much. But if your mom has a prescribed treatment, she should follow that one first of all. She can add supplements, but she shouldn’t give up the initial treatment. So basically, I advise your mom to try a glucosamine + chondroitin next time and see how it goes. Within a month or so, she should feel some improvement, otherwise it’s probably not the right product for her. But I’m pretty sure it will be. Here’s a list of the best supplements I tried, and this is my #1 favorite (it’s cheaper than most and works really well). So if she decides to try any, let me know how it goes. HI Heather, I’m also using Arthrozyme for a couple of weeks and I’m satisfied for now. Pain is not as bad as frequently and I feel like my flare-up days have become more rare. I’m also a joint supplements addict, meaning that I tried everything on the market (closely) with different success rates. I have psoriatic arthritis and anti-inflammatory compounds like turmeric and Boswellia serrata are helpful for me. Arthrozyme only contains one, so maybe if it had both it would be even more effective. But as it’s been just a few weeks since I’m using it, my opinion is not 100% to consider. I should normally wait a few more weeks to tell for sure. I’ve been wanting to ask you, there’s a product with a similar name to Arthozyme but I can’t really remember it. Do you happen to know the name? I heard it’s much better so maybe you can give me an opinion…Sorry if it sounds too confusing and thank you anyway, Grrtchen. Hello Gretchen. ArthroZyme seems to be working for you – at least in a decent manner. But I agree, you should give it a longer chance to see what it can do. So continue to use for 1 month, until you finish the bottle. If you ordered more bottles, you should really take all the pills – if they seem helpful. Most supplements have the best effect after 1 month – so 2-3 weeks are usually too early to tell. Maybe this psoriatic arthritis guide can additionally help you, besides the supplements. Also, certain diets can be really useful in this condition. Regarding your question, you’re probably talking about Arthrozene. I used to confuse it and Arthrozyme lots of times and take it one for the other. But I personally didn’t have amazing results with it – it helped a bit, but not considerably. Since I paid $60 on it, I would have expected more. So compared to Arthrozyme, it was more expensive and less effective. I know it’s very popular and works for some, because I had some positive feedback about it. But I also received many negative opinions from people, which shows it’s not a miracle maker. So out of these 2 – I advise you to stick to Arthrozyme, if you really want to. Otherwise, I can recommend you the best turmeric supplements I tried throughout the years. Some contain Boswellia, others don’t – but they are even more effective than the ones containing both herbs. Hope this helps you. You can let me know how Arthrozyme continues to work in the following weeks. Hello Will, thanks for your feedback on Arthrozyme Plus. If you have cartilage erosion, that’s what causes your knee pain. Your doctor is right – you don’t have arthritis yet, but you’re pretty close. In this case, Arthrozyme isn’t going to help a lot – because it’s based on anti-inflammatory herbs. There’s little inflammation in your knees, and Arthrozyme can only decrease that. But there’s a lot of cartilage erosion and Arthrozyme is not effective for that too. So that’s the reason why it didn’t really work. But you’re right – what you actually need is a supplement based on glucosamine + chondroitin. That will rebuild and protect your cartilages, so it will also prevent arthritis (or at least delay it). 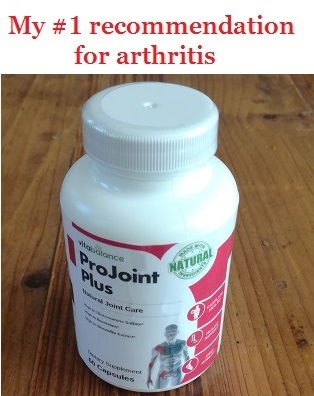 I recommend you to take a look at ProJoint Plus, because it’s my top recommended glucosamine supplement (because it’s cheaper than most). In case you need some more options, these OA supplements should be enough to choose from. You can also try some alternative remedies like Yoga, going for a healthier diet, using heating pads or anything else that seems to help the pain. If you’re lucky to live in a hot climate, that might help delay the appearance of your OA. Hi I’m taking Arthrozyme Plus for 2 weeks now and it’s making my stomach hurt so bad. I feel it especially 30 minutes after I take the pills, it doesn’t matter if I take them on my empty stomach or after food. I still feel intense cramps. Sometimes I get diarrhea too, but not really everyday; but I still think it’s because of these pills, because I never had stomach problems all my life before that. Will probably stop taking Arthrozyme pills, so far no difference in my knee pain. Maybe it’s too early to tell, but I can’t take the stomach pain anymore. Hi Salima, thanks for telling me how Arthrozyme Plus worked for you. I’m sorry to hear about your stomach pain, but I know that certain products cause similar reactions in certain people. I also experienced diarrhea and stomach pain from a supplement that worked fine for others (I’m talking about GNC’s version of turmeric). So it really depends. In this case, I advise you to stop taking Arthrozyme and see how your cramps go. If they disappear in less than 1 week, it was probably because of the pills. I’m personally pretty sure that’s the case, but try it to see for sure. If they don’t go away, it was probably just a coincidence. So you can continue Arthrozyme if you want, especially if you have any more pills left. 2 weeks is still too early to tell if a product works, so I say you shouldn’t draw any conclusions on its effect yet. I’m not really sure what kind of knee pain you have, but you can try another supplement. These are the top products I tried for achy knees, so you should find a better one on this list. (Some are really cheap, so don’t worry about price – I rarely recommend products that are expensive). Please let me know how it goes and if your stomach pain stops after you quit Arthrozyme. This Arthrozyme Plus was worthless for me! It did not do a thing for my painful knees. I know each person is different and one may get better relief from some products than from others. But why advertise this product so much if it doesn’t help everyone? And then you’re not willing to refund unhappy customers. It’s not a company I will do business again with! Hi Mark, I really appreciate your feedback on Arthrozyme Plus. It seems like it didn’t help you too much. I can’t really remember if this company promises to offer a refund or now. I tried many supplements throughout the years, so I don’t really remember each. But the point is that if they promised to refund customers, they must do it. You can tell them that you plan to contact Customer Service from your country. That could scare them and make them keep their promise. Just make sure to check the conditions of their money back guarantee. If they promise to refund people only for unopened bottles and yours are opened, then you can’t do anything about it. But if you have unopened bottles and they refuse to refund you, then it’s their fault. So you have the right to contact Customer Service. I too bought Arthrozyme and couldn’t feel no difference in my knees in the first days. But soon after my hands and legs started getting worse and I could barely stand. I also started having diarrhea and it was so bad that I got to the emergency room. They asked what meds I was taking and I told them about Arthrozyme, because I wasn’t taking anything else for months. They told me to stop it immediately and gave me some hydration treatments. In the next days I started getting better, obviously I wasn’t taking the pills anymore. Now it’s been more than 1 month and I’m feeling perfect. I would like to try the pills again, since I’ve got almost a full bottle, but I’m just so afraid. What if the symptoms come back again? What do you think I should do? Hello Rony, thanks for sharing how Arthrozyme worked for you. Unfortunately there seem to be a lot of bad news. If you got to emergency room, your condition must have been really bad. Now – I can’t really tell for sure what caused it. But since you’re saying you didn’t take anything else in the meantime, all evidence shows that Arthrozyme is the responsible for your problems. I came across some customer reviews complaining of diarrhea, but none of them mentioned it was as bad as yours was. But everyone is different, so it was probably these pills causing both the diarrhea and the additional pain. I personally wouldn’t try taking it again. I just don’t think it’s worth the risk. But if you really want to give it another shot (the full bottle, I understand you) – try taking one pill per day. You could even start with half a pill, but it’s more complicated to cut it in 2 since it’s made of gelatin and has powder inside. So try to take 1 per day for about a week. If you have any small symptom of diarrhea or extra pain, stop taking them and give them up forever. But if you don’t, continue with 1 pill per day then gradually get to 2 – and see if your joint pain improves. Hey! i used arthrozyme plus but positive effect ceased to appear. i’m 76, male, with knee and hip arthritis and had left hip replaced. my right one is close now, bcz it has little cartilage left. my knee is about the same. would be interested to try glucosamine, i heard that it’s good but never had the chance to see for myself. arthrozyme is probably not right for me, what do you think? Hello John, thanks for your feedback on how ArthroZyme works. You didn’t mention whether you have rheumatoid or osteoarthritis. But based on your description, it’s probably OA. You can check some of the symptoms and see if they match. So in case you have osteoarthritis, I’m not surprised that ArthroZyme didn’t work. This product contains anti-inflammatory herbs, so it’s meant to treat the pain caused by inflammation. That’s a typical problem in rheumatoid or psoriatic arthritis – which are caused by chronic inflammation. But in osteoarthritis, there’s little inflammation. The real problem is cartilage damage – because that’s causing the actual pain and stiffness. So that’s what you need to treat. Anti-inflammatory might help a bit (with the existing inflammation). But as there’s little inflammation and a lot of cartilage damage – the main cause still remains. So in OA, you need a product meant to rebuild cartilages – something with glucosamine and chondroitin. That’s what you need to try if you want some real improvement. My top recommendation is a product called ProJoint Plus, because it’s has the best ingredients for the price. It’s the most affordable supplement from the ones that were effective for me. But it’s not the only product that works – there are several others. So if you have a larger budget, you can choose the one that looks most promising for you. So I think you should stop taking ArthroZyme, especially if it doesn’t help at all. Hi Heather, thank you for reviewing Arthrozyme Plus but I must admit I’m quite surprised. I used it for a tendinitis that wouldn’t go away and I could soon quit Ibuprofen and other drugs that were causing me stomach pain. These pills were just great, my pain disappeared in a couple of days. and it didn’t return ever since. I also tried to rest and stop exercising more than I can take but I still think it’s these pills that saved me. I’ve been recommending Arthrozyme Plus to everyone from my gym since then. But I can’t tell you the feedback since most don’t trust supplements. Anyways, I’m surprised to hear it wasn’t effective for so many people (you and the comment authors). I’m sure it has downsides but it surely has some good points too..
Hello Andy, thanks for sharing how Arthrozyme Plus worked for you. I’m not surprised to hear the positive results you had with it. Tendinitis isn’t a major inflammation, as rheumatoid arthritis. So you shouldn’t need a high quantity of anti-inflammatory herbs – nor the strongest substances. That’s why I think Arthrozyme Plus helped you. It’s strong enough for your minor inflammation. But it’s the right product for someone with inflammatory pain caused by exercising. So you did well recommending it to your gym. You guys don’t need the strongest supplement, since you are healthy overall. So for your kind of problems, mild anti-inflammatory supplements should do the job well enough. 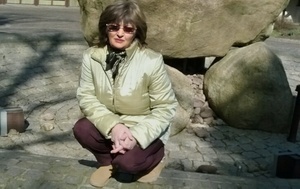 On the other hand, if you have inflammatory arthritis – Arthrozyme Plus isn’t always strong enough. That’s why there are some people who weren’t satisfied with it. They have more serious problems than yours, so they need a more powerful anti-inflammatory (like turmeric products). I hope you understand better the context now.